Tunnel leads from steps behind the former station building to closed stairwells between tracks. In 1848, the Ohio & Pennsylvania Railroad began building a line to cross westward from Pittsburgh into Ohio. By 1851 the line was substantially complete in Pennsylvania -- squeezing below the high cliffs that edge up to the right bank Ohio River near Pittsburgh. Closer to Edgeworth and Sewickley, the terrain relents and the floodplain widens to allow the railroad to venture slightly farther away from the river bank. The O&P RR was incorporated into the Pittsburgh, Fort Wayne & Chicago Railway which was subsequently acquired by the Pennsylvania Railroad in 1869. 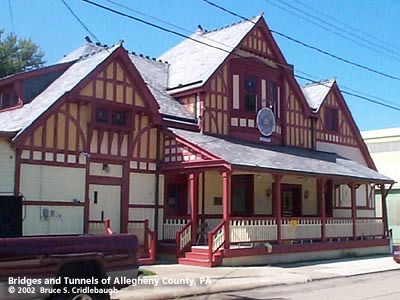 Named for the Indian word for sweet maple trees, the business center of the Sewickleyville developed north of the tracks with the Neo-Tudor Style PRR station built at Broad St in 1885. The remote town along the road to Beaver became a railroad suburb for wealthy businessmen of Pittsburgh. The railroad's course through Sewickley allowed the town to develop on both sides of tracks. By the late 1920's, the Allegheny County Commissioners were planning the construction of several 4-lane boulevards: Saw Mill Run Blvd, Allegheny River Blvd, Ohio River Blvd and Mosside Blvd. All but the latter were designed to be wide tree-lined parkways -- within the contraints of difficult topography and existing development. 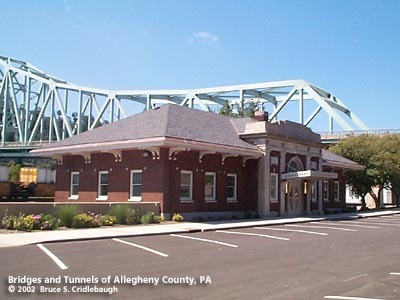 Through Sewickley, the Pennsylvania Railroad vacated their four-track right-of-way to permit Ohio River Blvd to enter the town. Beginning in 1926 the railroad was rebuilt two blocks to the south along the edge of the Ohio River. The move was completed in 1929 and the station built at that time still stands on Chadwick St in the shadow of the Sewickley Bridge. The station building is now occupied by a private business. 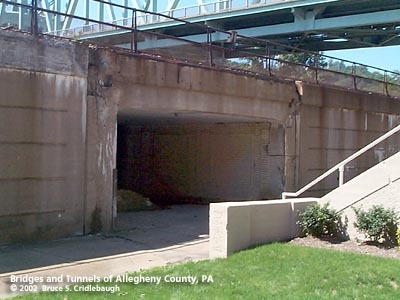 The deteriorating, tile-lined tunnel leading to the station platform is closed and the platform structures along the tracks are gone. The railroad traffic is almost entirely freight; the location is just a few miles from Conway, which once boasted being the world's largest railroad freight yard. Part of the project included moving of the 1885 station building. October 12, 1929, the wooden building was lifted from its former location near Broad St, lifted onto four railroad flat cars, and transported nearly 1/2-mile west to 20 Chadwick St. Today it is the Walter Robinson American Legion Post #450. Kobus & Consoli, "The PRR's Golden Triangle" & "The Pennsy in the Steel City"